Bienvenue le Cafe de Paris Slots, the 5 reel French-themed slot machine with fantastique payouts across 25 paylines! Vive le France and enjoy the attractive Café de Paris slots. Enjoy a Parisian café break with this elegant slots game. It features 5 reels and 25 pay lines and the reels are packed out with dainty delights and bistro-themed symbols which make it a truly chic affair. What’s more the maximum jackpot on offer is a tasty 9,000 coins and you can bet up to £10 per line. Café de Paris features Wild and Scatter symbols. 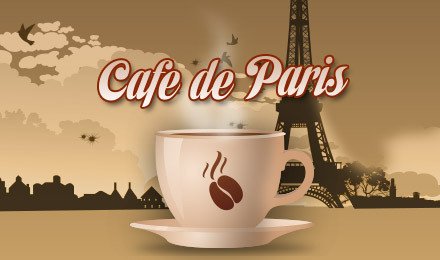 The Café de Paris logo is the Wild and can be substituted in for all other symbols except the Scatter. The Scatter is the Café image and this activates the free spins bonus round. This round can be re triggered at any time if you manage to spin three or more of the symbol again. This slot machine has a chic and fashionable theme and uses some really beautiful graphics. There’s the potential to win big jackpots and fun bonus games to making it a thoroughly enjoyable gaming experience.